2014 has been a year where I have found myself completely addicted to body care products. I’ll be honest – body care isn't the most exciting branch of beauty, for me it’s more of an everyday essential to have good products in my routine. Yet throughout 2014 I've found some absolute gems where body care is concerned; products I would repurchase in a heartbeat. These are my favourite body care products of 2014 (and products I think all of you should try!). Every morning and evening I make sure to pamper my feet as much as the rest of my body, applying creams, balms and lotions to keep my feet soft and happy. A favourite for me this year has been the luxuriously thick and deeply hydrating The Body Shop Hemp Foot Protector. Using Community Trade Hemp Seed Oil, it’s perfect for dry skin - I apply a generous amount morning and night, leaving my feet feeling super soft. I have the biggest addiction to body scrubs, always preferring the way my skin feels after it’s been massaged to smooth perfection. High-street or high-end, there’s some amazing scrubs out there which do the job perfectly – but none have made my skin feel the way the frank Original Coffee Scrub does. With the most addictive and heavenly scent of coffee with a touch of citrus, each use leaves my skin feeling like new. 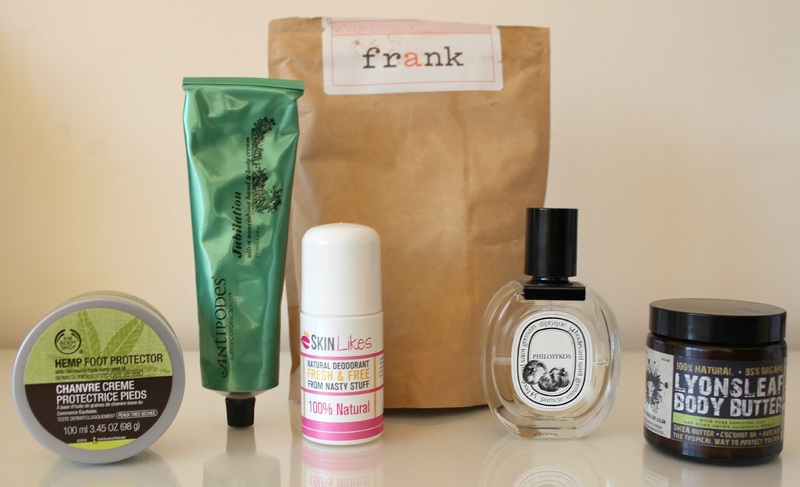 I plan on trying a lot more from frank in 2015, so if you've tried any other products in the range, I’d love to hear your thoughts on them! (Full review here). A product which has been a life-saver for me and benefited my skin more than any other, is the Skin Likes Natural Deodorant. A brand and product I was introduced to through The Vegan Kind monthly boxes, Skin Likes has saved my skin over the past few months. I've always suffered from eczema and always in the most awkward of places such as my underarms. With its natural formula and skin-loving ingredients, I can’t even remember the last time I suffered sore or irritated skin. This natural beauty has been a miracle worker for me, and there’s no brand or product I’d turn to now I've found the Skin Likes Natural Deodorant (full review here). 2014 has been an amazing year for fragrance releases, but there’s still a big soft spot in my heart for Diptyque Philosykos Eau de Toilette. A scent which will never be beaten as my absolute favourite, the memories this scent invokes in me leaves me craving Cyprus every time. Worth every single penny, a scent I’ll forever repurchase (full review here). A brand I was only recently introduced to is Lyonsleaf, and all the products I've tried so far have been absolute gems. A particular favourite is the Lyonsleaf Body Butter; a 100% natural body butter that contains 95% organic ingredients, with pure essential oils and Lyonsleaf’s very own home grown Calendula Extract. The scent is beautiful; a warming mix of Shea Butter, Coconut Oil and Avocado, with a luxuriously thick formula that sinks into skin with ease. It’s just utterly heavenly, and I am now a complete Lyonsleaf addict (full review here). Last but not least, and a brand which also featured in my Favourite Makeup of 2014 post, I couldn't share my favourite body care products of the year without including Antipodes. I'm a sucker for a good hand cream, and the offerings from Antipodes have been my favourite for a couple of years now. I adore all the scents in the range, but the latest I am addicted to is also the newest in the range; the Antipodes Jubilation Ultra Nourishing Hand & Body Cream. A replenishing cream that can be used on both hands and body (although I stick to using these as hand creams), is contains an skin-loving formula of pure plant oils and essential Omegas 3, 6 and 9 alongside a healthy dose of Vitamins A, C and E. With a stunning scent of exotic Feljoa and Wild Blackcurrant, my hands are left as soft as silk after each use. I'm still hoping one day Antipodes release fragrances to match their hand and body cream range, because each and every one is utterly stunning (full review here). Have any body care products stood out for you this year? Let me know your favourites! Some products I've not really heard much about here so i'm definitely interested in trying a few out/learning a little more about them. The Body Shop however is such a classic, I'm a huge fan of all their products from makeup to skincare to body care, even fragrance! Great post and thanks for sharing! The best of luck for the New Year & I hope you have a wonderful NYE! These all sound really great. I particularly like the sound of The Body Shop foot protector. I think a trip to The Body Shop is in order soon. Love this post, you've mentioned a few brands I wasn't aware so thank you, I will be hunting them out. I wish I was as good as you and cared for every inch of myself on a daily basis. One thing I need to get better at is moisturising from head to toe daily, and when I do get round to doing it, I love Molton Brown's Gingerlilly Body Lotion.